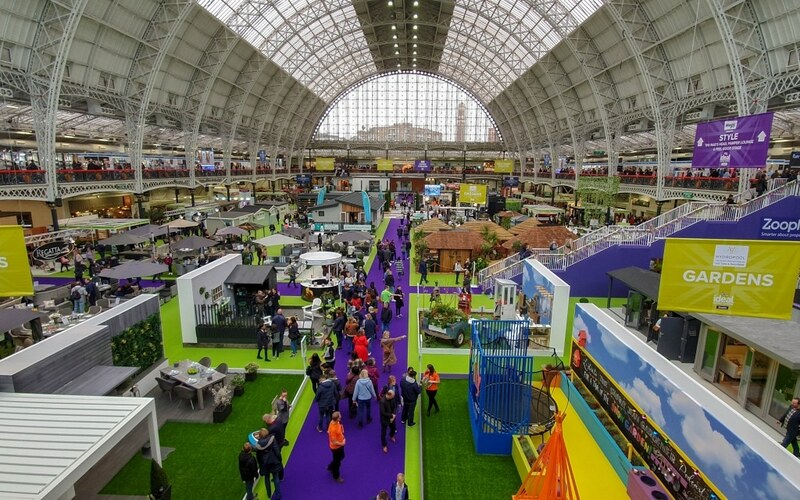 Who’s been to the Ideal Home Show before? I’ve never been before so was really looking forward to our visit last Saturday. Were currently busy planning our extension so have a head full of ideas, but normal life gets in the way and it’s always quite hard to discuss ideas together. Being able to travel up to London together and spend a day looking at all things interiors was a perfect opportunity! 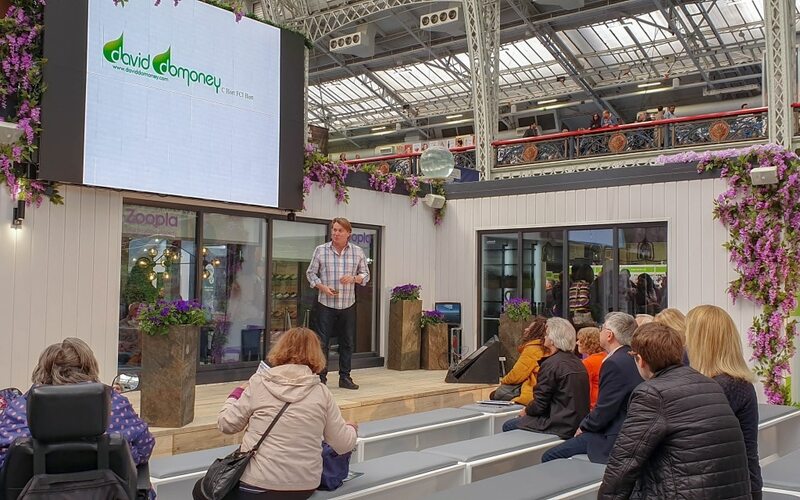 The Ideal Home Show is currently running from Friday 22nd – April 2019 and within easy access at the Olympia London. Travelling up from Southampton was easy enough, one train change and then an over-ground train to Kensington Olympia station. As soon as you step off onto the platform you can see the banner of the Ideal Home Show! 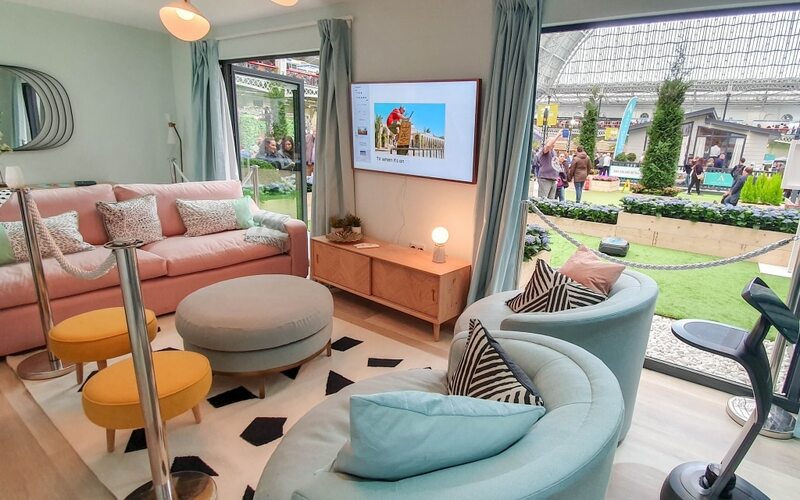 What’s Inside The Ideal Home Show? 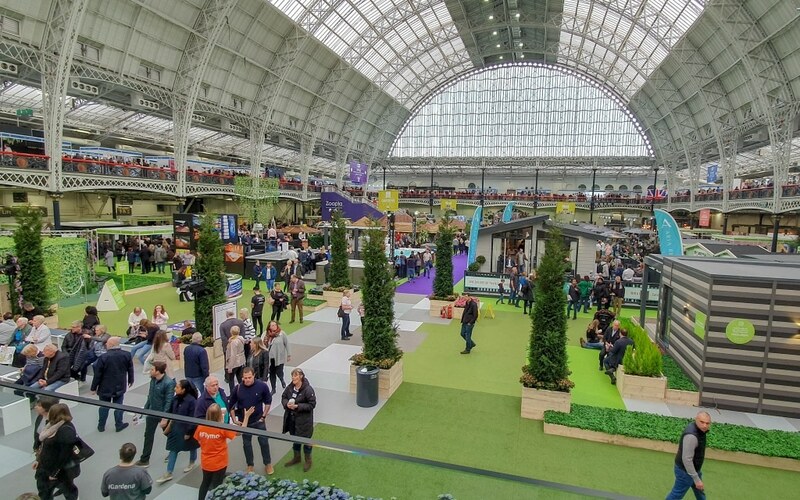 I didn’t know what to expect when visiting the Ideal Home Show, so I was super impressed when I walked through the door and was greeted by a huge selection of things to see and visit. There wasn’t just one room either, there were multi rooms and levels! 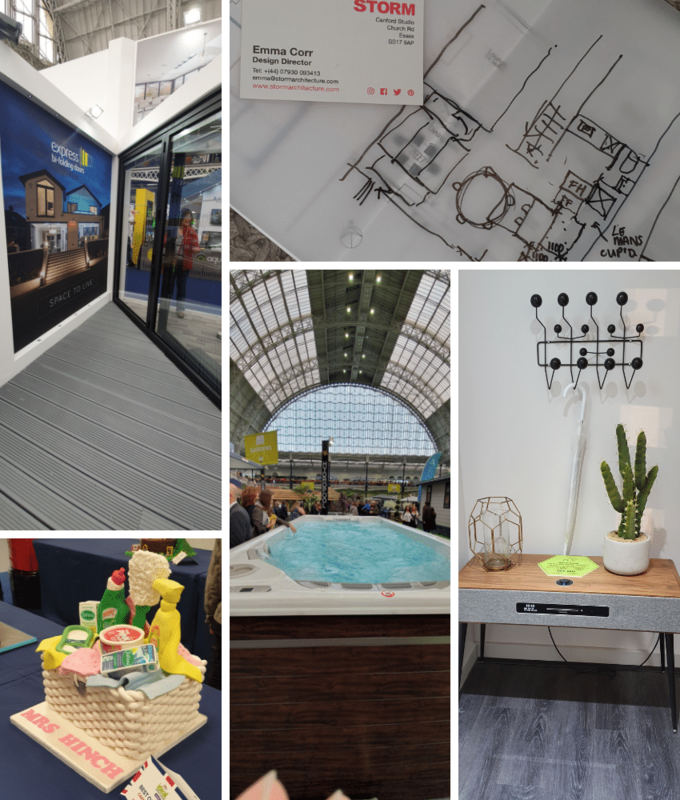 If I was to list everything that was at the Ideal Home Show this would be a very big blog post! 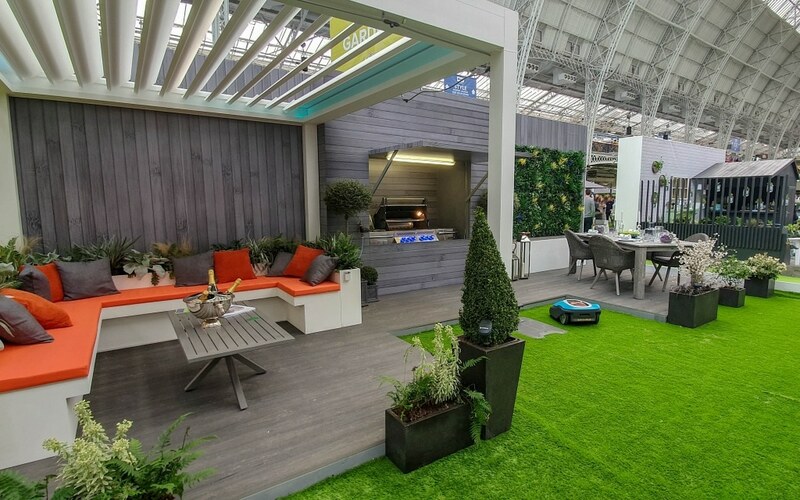 Gardens, with hot tubs, show gardens, garden furniture, cooking and seating. Interiors, with room sets, tiling ideas, furniture ideas, kitchen ideas. Cleaning, the different type of cleaning products, equipment to use. Gadgets, fun games for the kids, mobiles, gaming and gadgets to use around the home. Pamper zone, beauty, makeup, teeth whitening, hair and lots of different type of massage products. Expert Advice, bookable free 30-minute advice sessions. I spoke to an architect and kitchen designer. 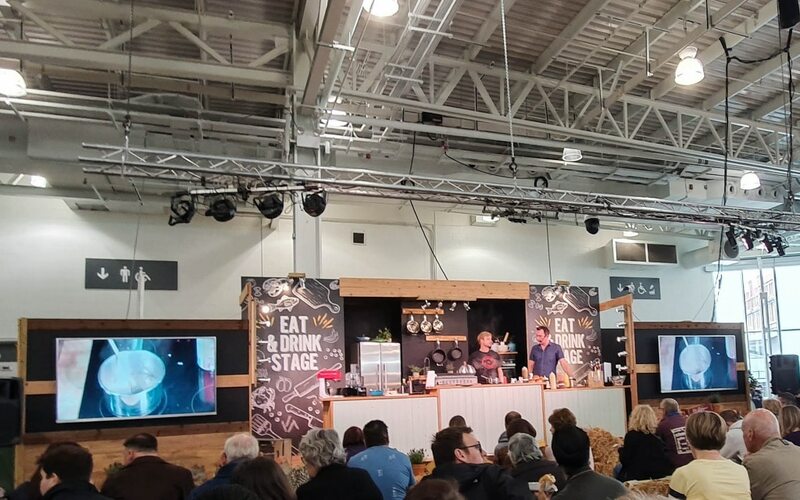 Eat & Drink Festival, a great place to sit, eat and watch live cooking. 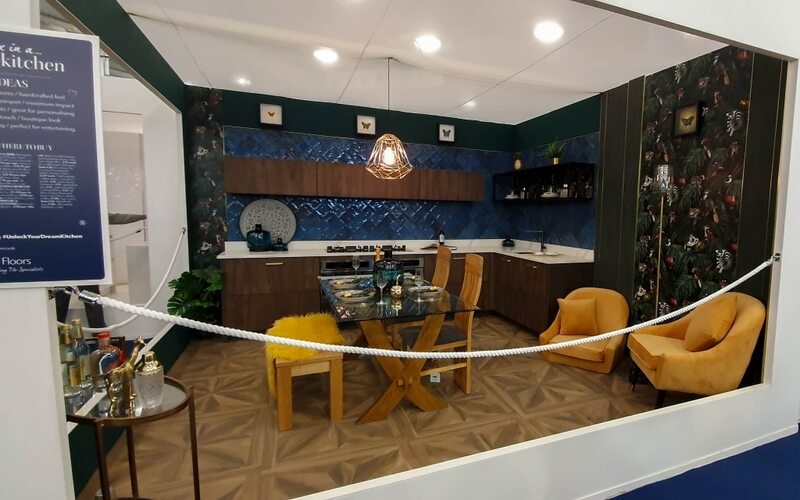 Inside the main area at the Ideal Home Show was The Evolving Home. Built with change and adaptability in mind, the modular system allows the homeowner to create and adapt their home that is perfect for their family. Constructed using 7 steel frame modular units it’s created a stunning home that is super quick to construct. These steel systems are cheaper and quicker to build than normal brick construction. I could have my extension done within a week and it would cost less!! Inside they have created a free flow of the rooms and placed modern systems inside the home, like Wifi fridge, boiling water taps, robot butlers and some lovely looking rooms. 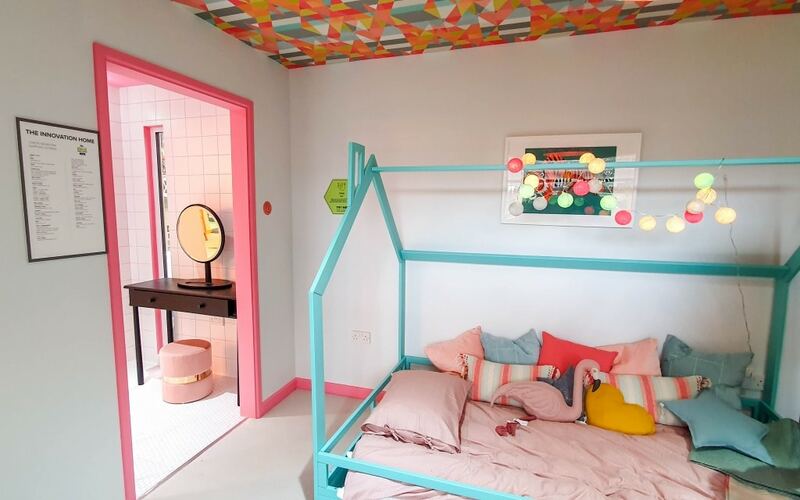 I would have loved there to be a few more room sets to get more interior design ideas, I loved seeing the ones that were there as it gave myself and my husband a chance to see more interior colours put together. I think it’s hard for some people to visualise the colours put together until you see them. The pink kitchen below would be scary to explain to someone but when you saw it in real life, it really did work. I think companies would easily sell their products if they displayed them more like this, as people want to try to put that look together in their own home. It was great to be able to look around at the different options for things, may that be for different companies or different styles that companies offered. I have been looking at flooring for the new extension and it was nice to be able to touch and show Kev which ones I loved. I also found an eco floor company that used reclaimed flooring which looked amazing. I would have never found these types of companies otherwise. I even found my favourite ever barista for the bedroom. 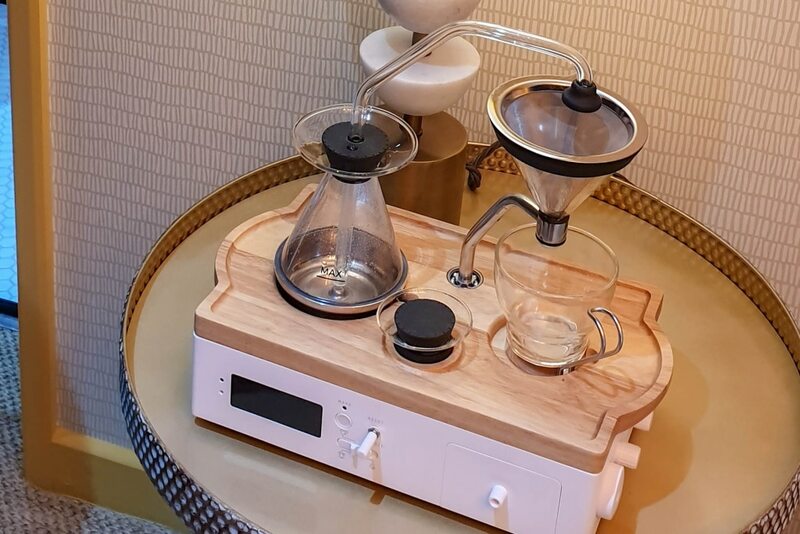 It’s an alarm clock and coffee/tea maker, how lovely would that be to wake up to freshly made tea in the morning. What Ideas Did I Get? Well, I now would love some bi-folding doors in the back of the house. Emma from STORM architects said how lovely it would be for me to have my office in the bright extension to the rear. I can spend the day looking out into the garden rather than a wall. A massive hot tub in the garden once the play area has gone!!! I love the side tables with a speaker inside the table. A resin driveway looks lovely and not at all slippery like I thought they would be. A tall modern radiator, rather than traditional ones. 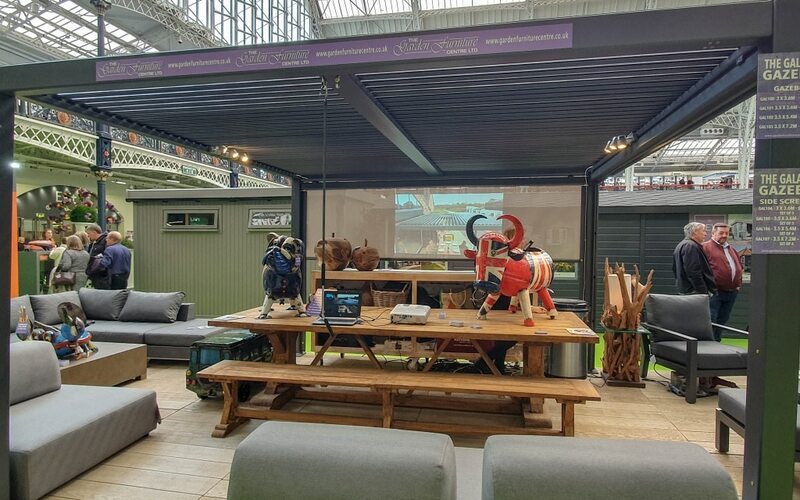 A garden pergola with a projector screen! I would love some pink…..somewhere! Oh and I loved the Mrs Hinch cake! 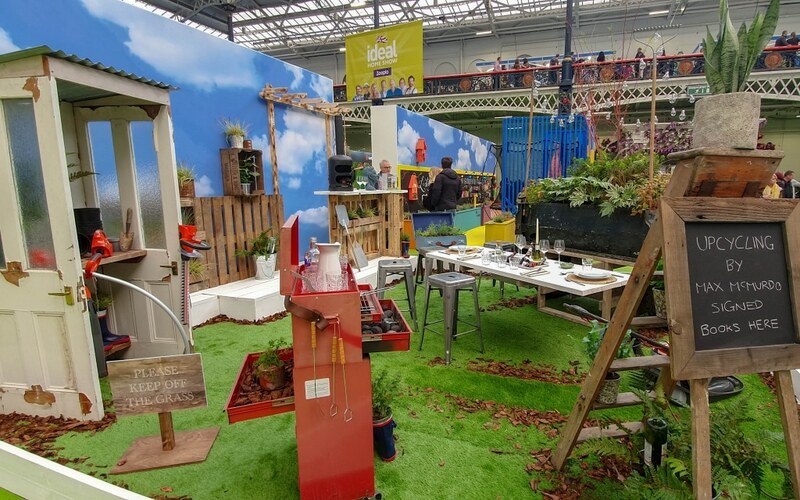 Weekday adult is £14 and weekend adult is £16, with children free and it runs until 7th April, so still time to visit the Ideal Home Show. Head over to my Instagram stories highlights where you can see some more things we got up to. *I was given complimentary tickets for the purpose of this review, however, all opinions are honest and of my own. Great post Steph. I think the IHS is great if you’re embarking on a big renovation project. 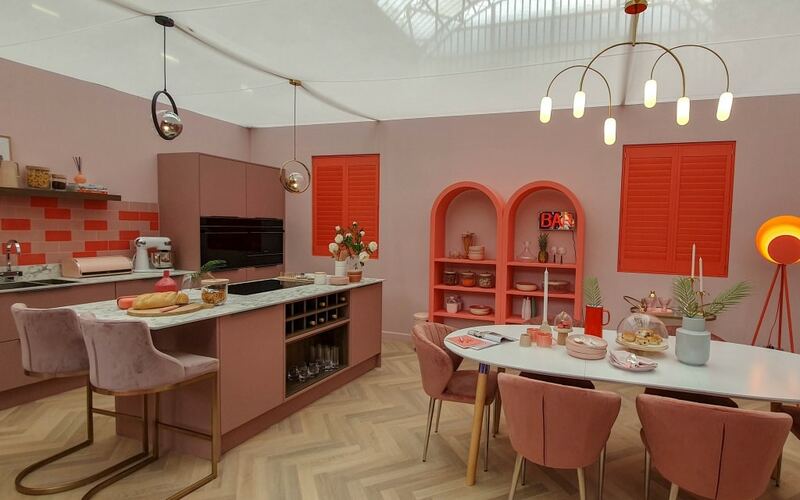 I do like that pink kitchen! It’s such a brilliant kitchen isn’t it, so colourful and brave! I’ve always been desperate to visit but Husband keeps me firmly away – he knows i’ll get too many expensive ideas!!! We are getting bifolds in our extension though which I am super excited about. Yes I think my husband thought the same!! Oh exciting about the bi-folding doors! There was lots of things for inside the home too, lots of furniture and styling ideas too. Wow, that looks really massive! What a lot to see. The closest I’ve ever been to any of these shows is when they do challenges there on The Apprentice, but they always look much smaller, I guess because they only show parts of it. It looks fab. I have not been myself but have family who have and loved it. So much inspiration every where! There was lots of inspiration! I have a nice list of things now! I love these types of shows, the gardening section and cleaning would have been really appealing to me as we are hoping to sort out garden area soon. There was some beautiful outdoor furniture there to pick from, some companies have such great ideas! I would love to go here one year but I think I would need to go when I have more money to spend!! Yes it was hard not to spend loads of money! I got lots of ideas for the future though! It looks great, glad you had a good time. I agree with your point about wishing there were more interior room sets at shows like this, it really is the best way of showing the products in action. Oh my goodness I think I need to stay away from here….it looks totally fantastic and I would have spent a fortune. I wish I was so creative as these people are with their home ideas. What a perfect timing for your ventures, and I can’t wait to see what you guys go for!! You could have kitted out your whole house easily that day! There was so many things to see and ideas for things, the list was building up! I didn’t realise there was so much variety of things to see at the ideal home show, I’d like to visit when it comes to Birmingham. I agree with you, I’d love a huge hot tub too. It would be so nice wouldn’t it! There was quite a few with people in front or an arm!! Thank you, I will be glad to get it started and all the decisions made! 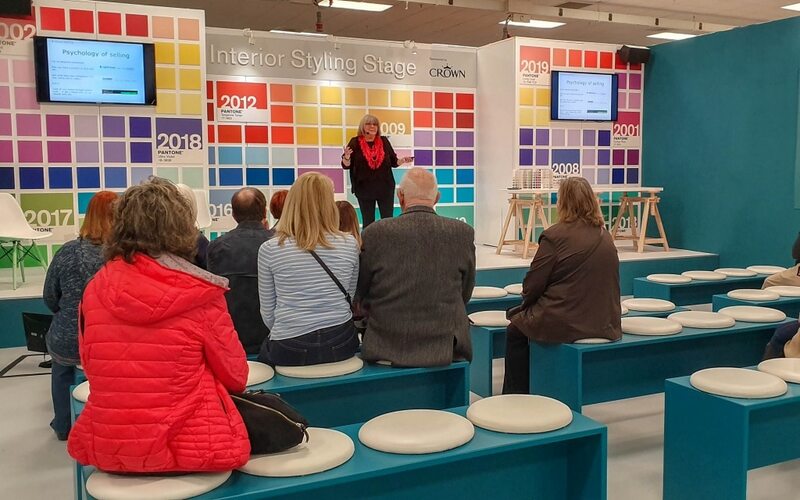 I love the Ideal Home Show and always seem to pick up fab ideas – you look like you’ve got some great ones too. Not sure about the projector screen in the garden – what if the sun is shining on it? It would be really hard to see… lol Love Max McMurdo – he’s fab!